Acknowledged author Michael R. Lindeburg PE wrote Mechanical Engineering Reference Manual for the PE Exam comprising 1488 pages back in 2013. Textbook and etextbook are published under ISBN 1591264146 and 9781591264149. Since then Mechanical Engineering Reference Manual for the PE Exam textbook received total rating of 4.5 stars and was available to sell back to BooksRun online for the top buyback price of $120.78 or rent at the marketplace. *Add the convenience of accessing this book anytime, anywhere on your personal device with the eTextbook version for only $59 at ppi2pass.com/etextbook-program. 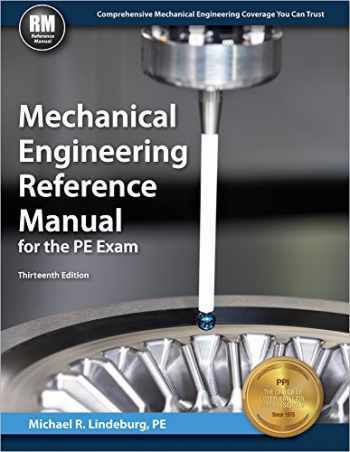 *MERM13 - The Reference Manual every PE Mechanical examinee needs!Michael R. Lindeburg, PE’s Mechanical Engineering Reference Manual, 13th Edition (MERM13) is the definitive reference book for the PE Mechanical Exam. This comprehensive manual covers all three disciplines of the PE Mechanical Exam - HVAC and Refrigeration, Machine Design and Materials, and Thermal and Fluid Systems.This must-have reference will fully prepare you for and aid you during the exam. Build exam confidence with a manual that follows NCEES exam specifications and addresses complex topics by parsing them into condensed, understandable, and readable sections. Over 375 example problems throughout the 76 chapters aid in your understanding of the exam topics. This manual includes over 120 appendices and a comprehensive index which includes thousands of equations, figures, and tables.PE Mechanical Engineering Reference Manual, 13th Edition (MERM13) includes:Complete exam review for the PE Mechanical exam:FluidsThermodynamicsPower CyclesHeat TransferHVACStaticsMaterialsMachine DesignDynamics and VibrationsControl SystemsEconomicsLaw and EthicsIndustry-standard terminology and nomenclatureEqual support of U.S. customary and SI unitsRecommendations for a study schedule to keep you on trackExam tips for exam-day readinessAfter you pass PE Mechanical Engineering Reference Manual, 13th Ed. (MERM13) will serve as an invaluable reference throughout your mechanical engineering career.